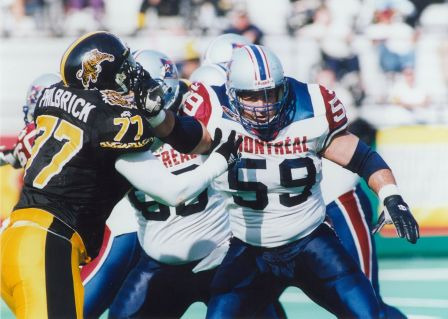 Pierre Vercheval attended the University of Western Ontario where he won the JP Meteras trophy as the top lineman in Canadian university football and participated in the 1988 East-West Shrine game. He was chosen in the second round of the 1987 CFL draft by the Edmonton Eskimos. Vercheval joined the Eskimos midway through the 1988 season, where he remained for five seasons, playing on Edmonton’s 1990 Grey Cup team. In 1993, he signed with the Toronto Argonauts where he played for five seasons and was a member of Toronto’s 1996 and 1997 Grey Cup championship teams. In 1998, Vercheval signed with the Montreal Alouettes. During his tenure in Montreal, he was named an All-Eastern three times and All-Canadian three times. He was named the CFL Most Outstanding Offensive Lineman for the 2000 season and played on Montreal’s 2000 Grey Cup team. Vercheval retired from the CFL following the 2001 season, he has worked as a television analyst for CFL games on RDS and remained involved with the Alouettes alumni association.